A skateboard is a type of sports equipment used primarily for the sport of skateboarding. It usually consists of a specially designed maplewood board combined with a polyurethane coating used for making smoother slides and stronger durability. Most skateboards are made with 7 plies of this wood. A skateboard is moved by pushing with one foot while the other remains on the board, or by pumping one's legs in structures such as a bowl or half pipe. A skateboard can also be used by simply standing on the deck while on a downward slope and allowing gravity to propel the board and rider. If the rider's leading foot is their right foot, they are said to ride "goofy;" if the rider's leading foot is their left foot, they are said to ride "regular." If the rider is normally regular but chooses to ride goofy, they are said to be riding in "switch," and vice versa. A skater is typically more comfortable pushing with their back foot; choosing to push with the front foot is commonly referred to as riding "mongo", and has negative connotations of style and effectiveness in the skateboarding community. Recently, electric skateboards have also appeared. These no longer require the propelling of the skateboard by means of the feet; rather an electric motor propels the board, fed by an electric battery. There is no governing body that declares any regulations on what constitutes a skateboard or the parts from which it is assembled. Historically, the skateboard has conformed both to contemporary trends and to the ever-evolving array of stunts performed by riders/users, who require a certain functionality from the board. The board shape depends largely upon its desired function. Longboards are a type of skateboard with a longer wheelbase and larger, softer wheels. The two main types of skateboards are the longboard and the shortboard. The shape of the board is also important: the skateboard must be concaved to perform tricks. Longboards are usually faster and are mostly used for cruising and racing, while shortboards are mostly used for doing tricks and riding in skateparks. Skateboarding started in California in the 1950s. The first skateboards were made from roller skates (attached to a board). Skateboarding gained in popularity because of surfing; in fact, skateboarding was initially referred to as "sidewalk surfing". Initially, skateboards were handmade from wooden boxes and planks by individuals. Companies started manufacturing skateboards in 1959, as the sport became more popular. During this time, postwar America, was carefree with children playing in the streets. Boards are also continuing to evolve as companies try to make them lighter and stronger or improve their performance. Skateboarding is a very individual activity. There is no right or wrong way to skate. Skateboarding still hasn't stopped evolving, and skaters are coming up with new tricks all the time. Skateboarding has gone through its ups and downs over the years. However, since 2000, due to attention in the media and products like skateboarding video games, children's skateboards and commercialization, skateboarding has been pulled into the mainstream. As more interest and money has been invested into skateboarding, more skate parks, and better skateboards have become available. In addition, the continuing interest has motivated skateboarding companies have to keep innovating and inventing new things. In 2020 Skateboarding will appear for the first-time in the Olympics in Tokyo, Japan. The following descriptions cover skateboard parts that are most prevalent in popular and modern forms of skateboarding. Many parts exist with exotic or alternative constructions. A traditional complete skateboard consists of the deck (often with griptape applied on top to enhance traction), trucks (with urethane bushings), wheels (with sealed bearings), bushings, nuts and bolts to fasten the truck and wheel assembly to the bottom of the deck. Older decks also included plastic parts such as side, tail, and nose guards. Modern decks vary in size, but most are 7 to 10.5 inches (18 to 27 cm) wide. Wider decks can be used for greater stability when skateboarding. Standard skateboard decks are usually between 28 and 33 inches (71 and 84 cm) long. The underside of the deck can be printed with a design by the manufacturer, blank, or decorated by any other means. "Long" boards are usually over 36 inches (91 cm) long. Plastic "penny" boards are typically about 22 inches (56 cm) long. Some larger penny boards over 27 inches (69 cm) long are called "nickel" boards. The longboard, a common variant of the skateboard, is used for higher speed and rough surface boarding, and they are much more expensive. "Old school" boards (those made in the 1970s–80s or modern boards that mimic their shape) are generally wider and often have only one kicktail. Variants of the 1970s often have little or no concavity, whereas 1980s models have deeper concavities and steeper kicktails. Grip tape is a sheet of paper or fabric with adhesive on one side and a surface similar to fine sandpaper on the other. Grip tape is applied to the top surface of a board to allow the rider's feet to grip the surface and help the skater stay on the board while doing tricks. Grip tape is usually black, but is also available in many different colors such as pink, red, yellow, checkered, camo, and even clear. Often, they have designs die-cut to show the color of the board, or to display the board's company logo. Grip tape accumulates dirt and other substances that will inhibit grip, so use of a grip eraser or rubber eraser is necessary after riding through mud or with dirty shoes. Attached to the deck are two metal (usually made of aluminum alloy) trucks, which connect the wheels and bearings to the deck. The trucks are further composed of two parts. The top part of the truck is screwed to the deck and is called the baseplate, and beneath it is the hanger. The axle runs through the hanger. Between the baseplate and the hanger are bushings, also rubbers or grommets, that provide the cushion mechanism for turning the skateboard. The bushings cushion the truck when it turns. The stiffer the bushings, the more resistant the skateboard is to turning. The softer the bushings, the easier it is to turn. Bushings come in varying shapes and urethane formulas as well as durometers, which may affect turning, rebound and durability. A bolt called a kingpin holds these parts together and fits inside the bushings. Thus by tightening or loosening the kingpin nut, the trucks can be adjusted loosely for better turning and tighter for more stability (useful when landing tricks). Standard kingpin nut size is 3/8" - 24tpi. The position of the hanger respect to the baseplate is also determined by the pivot, a rod that slots into the corresponding seat in the baseplate. The pivot stops the hanger from rotating around the kingpin. The pivot must allow some movement around the bushings and therefore is not a perfect fit. The space between the pivot and its seat in the baseplate is filled by a pivot cup, a plastic part that will take most of the wear and tear of the pivot and assist in centering. the hanger needs to be lubricated every so often. In general an axle width should be chosen that is close to the width of the deck it will be used with. For example, a 7.75" wide deck will usually be fitted with trucks that have axles between 7.5" wide and 8.0" wide. (Standard truck axle nut size is 5/16"-24tpi UNF, and the thinner "jam" style with an optional nylon lock.) Trucks that are too wide can make doing tricks difficult and can cause the wheels to get in the way when the skateboard is being ridden. Trucks that are too small can be hard to maintain stability and can cause wheel bite to occur when turning. Longboard specific trucks are a more recent development. A longboard truck has the king pin laid at a more obtuse angle (usually between 38 and 50 degrees) to the deck, giving a greater degree of turning for the same tilt of the deck. Many longboard specific trucks also have a reverse kingpin arrangement with the kingpins facing outward. The wheels of a skateboard are usually made of polyurethane, and come in many different sizes and shapes to suit different types of skating. Larger diameters (55–85 mm) roll faster, and move more easily over cracks in pavement and are better for transition skateboarding. Smaller diameters (48–54 mm) keep the board closer to the ground, require less force to accelerate and produce a lower center of gravity which allows for a better response time, but also make for a slower top speed and are better for street skateboarding. Wheels also are available in a variety of hardnesses usually measured on the Shore durometer "A" scale. Again like car tires, wheels range from the very soft (about Shore A 75) to the very hard (about Shore A 101). As the A scale stops at 100, any wheels labeled 101A or higher are harder, but do not use the appropriate durometer scale. Some wheel manufacturers now use the "B" or "D" scales, which have a larger and more accurate range of hardness. Modern street skaters prefer medium-sized wheels (usually 51–54 mm), as small wheels with lighter trucks can make tricks like kickflips and other flip tricks easier by keeping the center of gravity of the skateboard closer to the deck, thus making the deck easier to spin. Street wheels are harder (A 100/A 101). Vertical ramp or "vert" skating requires larger wheels (usually 55–65 mm), as it involves higher speeds. Vert wheels are also usually slightly softer (A 98/ A 99), allowing them to maintain high speed on ramps without sliding. Slalom skating requires even larger wheels (60–75 mm) to sustain the highest speeds possible. They also need to be soft and have better grip to make the tight and frequent turns in slalom racing. Even larger wheels are used in longboarding and downhill skateboarding. Sizes range from 65 mm to 100 mm. These extreme sizes of wheels almost always have cores of hard plastic that can be made thinner and lighter than a solid polyurethane wheel. They are often used by skateboard videographers as well, as the large soft wheels allow for smooth and easy movement over any terrain. Each skateboard wheel is mounted on its axle via two bearings. With few exceptions, the bearings are the industrial standard "608" size, with a bore of 8 mm (or 10mm depending on the axle), an outer diameter of 22 mm, and a width of 7 mm. These are usually made of steel, though silicon nitride, a high-tech ceramic, is sometimes used. Many skateboard bearings are graded according to the ABEC scale. The scale starts with ABEC1 as the lowest, followed by 3, 5, 7, and 9. It is a common misconception that the higher ABECs are better for skateboarding, as the ABEC rating only measures tolerances, which do not necessarily apply to skateboards. Bearing performance is determined by how well maintained the bearings are. Maintenance on bearings includes periodically cleaning and lubricating them . Bearings that are kept unmaintained have their performance greatly lowered and will soon need to be replaced. Bearing cleaning kits are commonly available on the market. The ABEC rating does not determine the speed or durability of a skateboard bearing. In particular, the ABEC rating says nothing about how well a bearing handles axial (side-to-side) loads, which are severe in most skateboard applications. Many companies do not show the ABEC rating, such as Bones Bearings, which makes bearings specifically for skateboarding, often marketed as "Skate Rated". Each bearing usually contains 7 steel or ceramic bearing balls, although other configurations are used as well. Mounting hardware is a set of eight 10-32 UNF bolts, usually an Allen or Phillips head, and matching nylon locknuts. They are used to attach the trucks (and any type of risers) to the board. Some sets have one different colored bolt to show which side is the nose of the skateboard. Hardware is available in various lengths for mounting trucks with or without risers. Risers increase the space between the truck and the deck. This allows the truck to twist further without causing wheel bite (when the wheel touches the deck and stops rotating). Wedges can be used to change the turning characteristics of a truck. Shock pads are made of polyurethane and rubber. They are very similar to risers but vary in the fact that their sole purpose is to cushion the board from the trucks. Since the trucks are metal and the board wood, whenever the board hits the ground after doing a trick, the energy goes through the truck to the board ─ this has caused boards to crack, split, or even break in half, and shock pads were created to prevent this. Rails (or ribs), are narrow strips of plastic or metal that are attached under the deck lengthwise along the edges. They are used for additional grip for grabs, and to enhance sliding while protecting the deck's graphics at the same time. Rails also provide a more consistent feel for slides, as the slide of a regular skateboard will suffer from the wear of the paint or varnish on the bottom of the board. Although rarely used anymore, they are useful for experienced skaters that are capable of grabs. Sliptape is a clear piece of self-adhesive plastic that sticks to the underside of a deck. It helps protect the board's graphics and allows the board to slide more easily. Another name for this is everslick. A lapper is a plastic cover that is fastened to the rear truck and serves to protect the kingpin when grinding. It also prevents hang-ups by providing a smoother transition for the truck when it hits an obstacle or a metal pipe or round bar. A nose guard is a plastic bumper used to protect the front of a skateboard which was once popular but is now only commonly seen on older board models. Bolted onto the underside of the tail end of a skateboard, the tail guard (also known as a "skid plate") protected the tail end from skid stops and other maneuvers that would otherwise wear away the wood (commonly known as razor tail) and decrease the longevity of the tail. Typically made of plastic, these were widely popular in the '80s but their usage quickly diminished with the arrival of two-tail board designs, which became increasingly popular in the '90s. A "tail devil" is a sparking device made of flint which is placed either on the tail or nose of the skateboard (or both) to create a sparking effect mainly visible after dark when the tail or nose of the boards scrapes against the ground. Plastic half tubing that protected the axles of the trucks. In the 1980–85 period, shopping cart handles were cut by some to fit as a makeshift coper. Sublimation (phase transition) is the transition of a substance directly from the solid to the gas phase without passing through an intermediate liquid phase. Sublimation is an endothermic phase transition that occurs at temperatures and pressures below a substance's triple point in its phase diagram. In this case, ink is transferred to a base layer, fibreglass for example, through heat and pressure, the result is a full color graphic that will not come off as easily as the more common heat transfers. This application is often found with bamboo boards and composite construction longboards where fibreglass can allow for various degrees of flex or stiffness depending on the ride you're looking for, cruising and carving versus slalom and downhill. 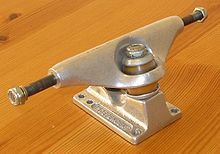 While not part of the actual skateboard, a skateboard tool capable of mounting and removing wheels and trucks, adjusting kingpins on trucks, re-threading wheel axles, working with bearings, and sometimes applying grip-tape has become more popular as new skate tools are introduced. Some include a metal grip-tape file and can include a bottle-opener. Look up skateboard in Wiktionary, the free dictionary. Wikimedia Commons has media related to skateboards. ^ "SKATEBOARDS: FIT & TYPES". LiveStrong. Retrieved 2012-06-23. ^ "Skateboarding: From Wooden Box Boards to Commercial Mainstream". ^ "Scholastic News: Skateboarding". teacher.scholastic.com. Retrieved 2018-03-26. ^ "Skateboarding Will be in the 2020 Olympics". 2016-08-03. ^ "Penny Nickel Skateboard Review". Ride as F*ck. Retrieved December 15, 2015. ^ "SKATEBOARDS". 2017-06-15. Retrieved 2017-08-30. This page was last edited on 19 April 2019, at 13:34 (UTC).